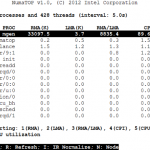 NumaTOP is an observation tool for runtime memory locality characterization and analysis of processes and threads running on a NUMA system. It helps the user characterize the NUMA behavior of processes and threads and identify where the NUMA-related performance bottlenecks reside. The tool uses Intel performance counter sampling technologies and associates the performance data with Linux system runtime information, to provide real-time analysis in production systems. Characterize the locality of all running processes and threads to identify those with the poorest locality in the system. Identify the “hot” memory areas, report average memory access latency, and provide the location where accessed memory is allocated. Provide the call-chain(s) in the process/thread code that accesses a given hot memory area. Provide the call-chain(s) when the process/thread generates certain counter events. The call-chain(s) helps to locate the source code that generates the events. 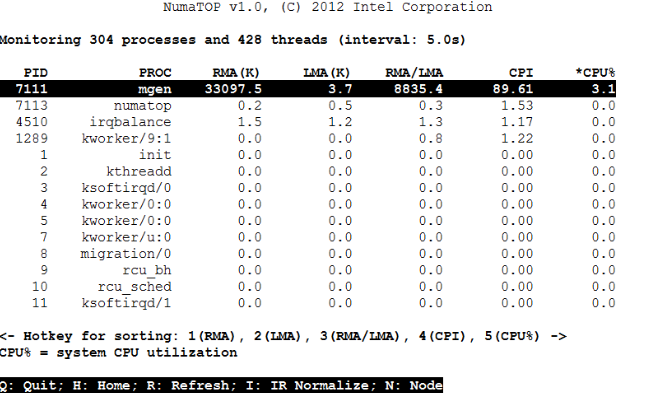 Provide per-node statistics for memory and CPU utilization. Show, using a user-friendly interface, the list of processes/threads sorted by some metrics (by default, sorted by CPU utilization), with the top process having the highest CPU utilization in the system and the bottom one having the lowest CPU utilization. Users can also use hotkeys to resort the output by these metrics: Remote Memory Accesses (RMA), Local Memory Accesses (LMA), RMA/LMA ratio, Cycles Per Instruction (CPI), and CPU utilization. numatop supports the Intel® Xeon processors:5500-series, 6500/7500-series,5600 series, E7-x8xx-series,and E5-16xx/24xx/26xx/46xx-series.